Here is the masterpiece! We made the tombstones and skulls with Baker's Dough. Add more flour if it feels too sticky. We added food coloring for a nice gray effect. Poke toothpicks into the skulls and tombstones before baking. Bake in a 300 degree oven for about 60 minutes or until skulls harden. Watch out because dough can turn brown when it is too hot or overcooking. To me, that added to the effect. 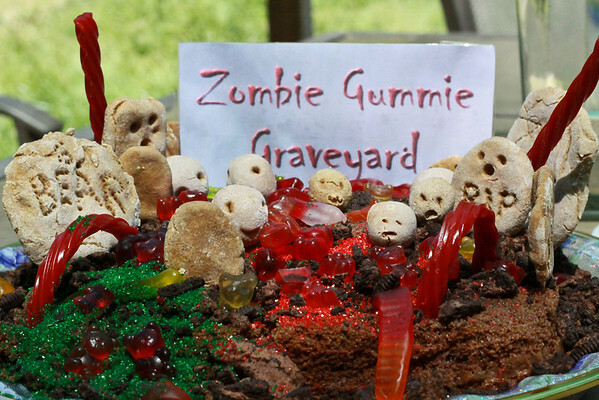 Gummy Bears, Gummy Worms, and colored sprinkles add to the graveyard! This cake was for an Ugliest Darn Cake Competition and it won Best of Show. Happy Zombie Gummy Bears!